We hear about the famous War on Christmas that our secular society wages with great intensity. However, the latest news from the front is not encouraging for those who would worship around a holiday tree. According to a recent Rasmussen report, 88% of Americans will celebrate Christmas this year and 81% of that group will celebrate it as a religious holiday. From these statistics, we can clearly deduce that Christianity and Christmas have yet to disappear as of 2011. The ferocious onslaught of secular humanism rages as it pushes its agenda through the media, the political world and our schools. However, the effects of the birth of one solitary Infant 2011 years ago — the Infant Jesus — cannot be extinguished. On that marvelous day filled with grandeur and joy intertwined with the sufferings that Our Lady and Saint Joseph endured having been rejected throughout Bethlehem, Our Lord came to fulfill the prophecies of the Old Testament and bring redemption and salvation. He came to establish His Church, which would come to be the most efficient, salvific and maternal institution ever known to man through which multitudes of souls would be saved. She is the holy deposit of everything that is good, true and beautiful, and all of this started with the first step of an Infant that was discreet, humble and hidden along His path of suffering, struggle and triumph. This tiny Infant confronts a world that boasts of tolerance, coexistence, freedom of speech and religion but simultaneously declares war on Christmas and Christians alike. Despite this world’s banning of Christmas scenes in the public square, the proclaiming of “holiday trees” and use of the sterile greetings such as “Happy Holidays,” the spirit of Christmas cannot so easily be suppressed. The sublime example of a God who became Flesh and dwelt amongst us powerfully fights back. Despite everything, Christmas is still impregnated with the notion of the birth of Our Savior, where in that holy and silent night, we still sense the sweetness and perfections that emanated from the Divine Infant in the manger in Bethlehem. We can see this in a performance of Handel’s Hallelujah chorus by the Opera Company of Philadelphia at Macy’s in Philadelphia in 2010. This surprise performance not only delighted everyone there, but it was recorded and received nearly 8 million views on YouTube with almost 5 thousand comments. With such reactions, we cannot conclude that secular humanism has conquered the heart and soul of Western man. 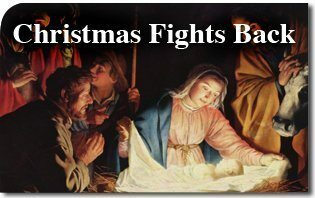 We at the American TFP, pray that you are blessed with all the graces of the serenity of the first Christmas and an indomitable spirit to fight heroically for Our Lady and Her Divine Son. This entry was posted in Catholic Perspective, Fighting the Culture War and tagged America, Bethlehem, Birth, Catholic, Chorus, Christianity, Christmas, Divine, earth, Family, Fatima, freedom, God, good will, Hallelujah, Handel, heroic, holiday, humanism, Infant Jesus, Joseph, night, Opera Company, Our Lady, peace, Petition, Philadelphia, religious, Saint, Savior, School, silent, society, spirit, TFP, Tradition, War, west, world by Gary Isbell. Bookmark the permalink.